You'll be £4.99 closer to your next £10.00 credit when you purchase Tracing Your Family History on the Internet. What's this? YFT writer Chris Paton’s 2011 guide provides a practical guide to using the internet for research, with due warnings about its limitations, as well as its strengths. Paton has unearthed some very valuable web resources on top of the expected local family history societies and genealogical websites. 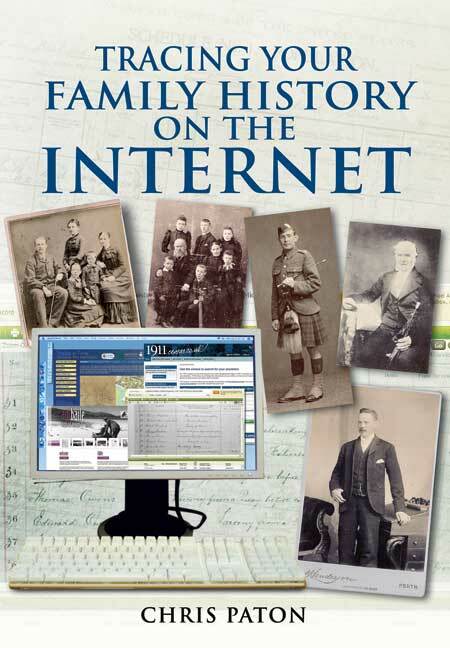 Overall this is a valuable guide to family history on the Internet that should be of value for several years. There is no doubt that the world wide web has transformed genealogical research and this is an invaluable guide clearly laid out and packed with information. I cannot recommend this book too highly. Most books that aim to help researchers find websites contain lengthy lists of supposedly useful addresses. Chris Paton tackles the subject very differently. This volume explains how to find information on the internet, yet urges caution in using much of what is found online. While many URLs are included, the bulk of the book is in narrative form. The author assumes his readers have a basic understanding of research techniques, but carefully introduces them to the concept of gateways and portals. He then reviews websites of the main UK archival institutions, such as The National Archives, before mentioning commercial firms. 'Genealogical Essentials' then looks at records of civil registration, the census, parish records and probate. There are meaty topics like occupations and migrations, and plenty of suggestions to get the very best from browsing the web. Guidance on the sharing of information and social networking concludes a helpful overview of genealogy resources online. We all know that there is an enormous amount of family history produced online, some of it reputable and well researched and some of it of dubious authority. Chris Paton gives you a guide to what is out there, how you can share your own research with others, and also what the pitfalls are and how you can make your own judgement of the material available. He describes the gateway sites and the commercial vendors; lists where you can find the genealogical essentials; i.e. bmd's, censuses, newspapers etc; occupational records; and then looks at those records specific to the geographical parts of the United Kingdom. A very good overview of what is available. While any serious researcher knows that original sources ultimately have more authority, nowadays who can say that they never use the internet for researching their family history? Certainly not author, genealogist and regular Your Family Tree writer Chris Paton, who is well-known for his excellent blog on Scottish family history news. Now Paton has marshalled his expertise and culled his internet browser bookmarks to provide a thorough guide to online family history resources. it isn't pitched at complete beginners, but caters for everyone- newcomer and old-hand researchers alike will find useful information here and new links to take a look at and explore. The material is well organised by theme, taking in occupation records as well as the major sources, and with useful sections, as one might expect, on Scotland, Wales and other regions in the UK. As a lively and active social networker himself, it;s also no surprise to see Paton providing a snapshot of blogs and social networking websites such as Twitter and so on as well. This book offers a serious rival to previous leading books on web genealogy. Read it for a detailed and up to date guide for useful internet resources. This is a new, 2011 publication produced with the UK family historian in mind. The nearly 200 pages are divided into 10 chapters, plus front and end material. As an experienced family historian familiar with much of the content I'll keep the book to hand for a while as a reference. Newcomers, likely attracted by the title, will find good value in this handy reference. Just as I was beginning to think that everything – every aid, every guide, every book – had been written to edge the family historian towards his or her ancestors, along comes Tracing your Family History on the Internet. But do we need it? After all, with what we have already to hand, we must surely have found our must–searched–after relatives by now: their records must reach wall–to–wall; ooze from our filing cabinets, family albums and bookshelves. Well, if that indeed be the case and those elusive grandparents, great uncles and aunts and armies of cousins unglimpsed since dad was a boy are all now nicely tucked up and reinstated, it is extremely unlikely that this was achieved without the use of the internet. But oh, what a frustrating task that was. Clicking here, clicking there and getting nowhere. And not knowing where to click in the first place, surely the worst aspect of modern–day research. Well, Chris Paton's book – thorough and nicely set out so as what we want can be easily found – will without a doubt fall into the 'best-thing-since-sliced-bread' category of published material. Here, one might say of course, are details of where we can access birth, marriage and death certificates, census returns, parish and church records. But even in these familiar 'first-place-to-look' departments we will find something new: 'Well, I never knew they were there!' Here too, and supplied with more information than thought imaginable, are sections telling us where to go for adoption records, probate, tracing our overseas relatives, members of the law, medical and business world forebears. Did your ancestors 'tread the boards'? Well, much is online for the theatre and music hall. There are more than 30 websites dealing with maps and gazetteers, should we wish to know where Great Uncle Arthur lived, went to school and worked. We can find newspaper websites (almost three pages on these), and those for street directories. Twelve pages are dedicated to the armed forced. There are also many covering mining, where the sad lives of female and child employees can be imagined thanks to the wealth of information now available via our computers. The endless deaths in our mines can be found online too. In addition, there are many locally based website that we may mark as 'essential' to our genealogy research: archives, libraries, family history societies. Here, beginning at page 56 and ending at 183, we find listed – Bedfordshire to Yorkshire, Anglesey to Radnorshire, Aberdeenshire to the Western Isles, Antrim to Tyrone– site after site dealing with surnames, monumental inscriptions, lists of clergy and those baptized, married and buried in their churches. Having fed our computers with an endless diet of information, we may then like to let others in on what we have found; see what they can give us, perhaps. Mr Paton's Social Networking chapter will help with that. A wonderful book and a first class piece of research by the author. – Up-to-date information with something new even for the seasoned genealogist. The author writes about the proliferation in recent years of research possibilities using the internet but he also cautions the readers as to the need to verify information against original records. The book has sections on general sources, the essential basic records, occupations, emigration and migration and social networking. The most useful chapters are probably those on the separate counties of the Untied Kingdom which are set out county-by-county giving details of many local websites. Reflects the source that many family historians starting out n their quests will explore in the early stages - the internet. This is a comprehensive guide to what is available on the web, either as a free download or a subscription site. This book should be beside the computer of every family and local historian in the land. Not only does it cover gateways and key institutions and genealogical research essentials, but it also has a section on occupational sites, and a gazetteer of sites for the counties of England, Wales, Scotland and Northern ireland, as well as Crown Dependencies and the Empire. There is a wealth of material to be found online for your family history research, often in the most unusual of places, and this latest Pen and Sword guide provides a welcome breakdown of some of the key resources available for both Scotland and the rest of the UK. This book is split into ten chapters. The first three sections look at genealogical essentials such as key gateway sites, sources for vital records and occupational websites. The next five chapters then travel through the United Kingdom, one country at a time, as well as the Crown Dependencies of the Isle of Man and the Channel Islands, to look for some of the very best online offerings to help with your research. The final chapters deal with with empire and migration and social networking sites. As well as detailed descriptions of what to expect on such sites, the book also flags up some of the do's and the don'ts of internet-based research. An essential for your genealogical library. In the modern world exploding with information and new technological discoveries human beings tend to get lost and confused. Feeling isolated, constantly seeking their place in the stretching universe people start to look into the well of the past in search of the memories, long forgotten family stories and histories, that would help to re establish the balance between the future, presence and the past. As Chris Paton, a genealogist and a writer, indicates, 'the hunt for the history' does not only limit itself into family talks or scan of the available at home documents as an easy access to the world wide web allows it to be extended into local, national and even international sources available online. In his book, 'Tracing Your Family History on The Internet', the author equips the reader not only with the advice on how to conduct the research suggesting deep insight into every aspect of the family life but more importantly indicates the direction on how to develop the search in order to achieve the best results. The author flags up the most important and valuable web sites offering the information about the history of the population, for example knowledge of baptisms, marriages and deaths, such as Family Search (at www.familysearch.org) or National Archives (at www.nationalarhies.gov.uk) but also provides words of caution about the internet searching and re sourcing. The evolution of the web results in the pages being closed, redirected and new sites appearing thus influencing not only the quality of the findings but more importantly the final results. Thus, the author advices great caution when approaching online sources and suggests checking and re checking the originality of the record. Apart from the guidance in the search of your family history, the book is filled with the addresses of the web sites on the national level offering more general knowledge but also rich lists of the addresses of the local and more specific sites, such as Royal Navy or RAF, providing more in depth and specific information. The clear layout of the guide helps the reader to excerpt all the useful information making the family history search a thrilling adventure. his is an invaluable and up-to-date handbook. I am not a family historian but have a parallel interest to that of the author in finding and evaluating websites for local history research. The book is not a technical tome but primarily a guide to the most useful websites for genealogy, both commercial and free. It is useful both for beginners and the experienced. The first chapter on Gateways and Institutions covers the whole of the UK, the Republic of Ireland, the Channel Islands and Isle of Man, an approach repeated throughout the book. The second chapter covers the Essentials of electronic access to BMD records, censuses, maps, gazetteers, directories, newspapers, and wills and probate. A useful project to compile an online finding aid to early probate records is described, although the author’s wise words about investigating exactly what is covered needs to be recalled. Subsequent chapters cover ways of finding online occupational and denominational records and then, most substantially, a review websites county by county. The author points out that some websites such as the British Library’s Burnley Collection of early newspapers are effectively available only to those who have access through a subscription by a local authority or educational institution. On this see ‘Connect to the Native Interface’: access to electronic resources for independent scholars, in The Local Historian 40:4 (November 2010) from the British Association for Local History. Amen to the preface which stresses the need to understand the research process and the nature of the records which are being consulted! Many family historians who want to go beyond the basics will find courses advertised as ‘local history’ useful. The overlap between family, local and social history is very great, and locating records and learning to read them is fundamental to all. The book is attractively presented with a glossary, further reading and index. Ever since the internet has been invented, finding and sourcing information has been revolutionized and finding things such as your family history has never been easier. Gone are the days of trailing through hundreds upon hundreds of documents looking for one tiny piece of information, as cyber space can get you there in a few clicks. However, as great as the internet may be, not everything is true and there are quite a few things to avoid as you will find out in Tracing Your Family History on the Internet. Written by Scottish genealogist and writer Chris Paton, this useful and informative book is sure to be an excellent guide and addition to your collection. Split into ten chapters covering everything from maps, occupational records, immigration as well as specific information on family histories in England, Wales, Scotland and Northern Ireland, you won't need to look anywhere else when wanting advise on how to and where to start Tracing Your Family History on the Internet. about the Channel Islands and the Isle of Man, as well as a chapter about Empire and migration. There is also valuable advice about social networking online. There are enough links here to make your mind boggle: sites containing wills, parish records, photos, newspapers, local history, war memorials, maps, occupational histories, museums, criminal is included are brief, and whether or not you have to pay for them is often unclear. Tracing Your Family Tree on the Internet is a sound, up-to-date book that is well worth having to hand – however knowledgeable an online genealogist you are.